While artists working in studios and regularly interfacing with pro-audio gear will prefer the robustness of a balanced output, not everyone will require it, and some folks will appreciate the improved workflow and concise cabling without the cost of a fully balanced circuit. The unbalanced version uses a passive circuit to convert the unbalanced modular signals to a DB-25 and visa versa. When converting unbalanced to balanced, the signal is connected to pin 2 (hot), pin 3 (cold) is connected to ground, and pin 1 (ground) is also connected to ground. This results in a 6dB loss of signal naturally. An additional 6dB pad is provided in-line which is bypassable using a set of jumpers on the rear of the module. When converting from balanced to unbalanced, pin 2 (hot) is used, while pin 3 (cold) is left unconnected. Pin 1 is connected to ground. Note that this is the preferred connection for most electronically balanced circuits, but will not work for transformer balanced outputs. This is rare (and expensive), so if your gear uses transformer-balanced outputs, you’ll want the electronically balanced version of the ‘io. Even with a padded DI, the signal coming from your modular can be too hot for the internal circuitry of the DI or the mic-pre. When padded enough, you’re attenuating it down to mic levels just so it can be re-amped to balanced studio levels. The nw2s::io has enough headroom to directly convert your high-voltage modular audio signals (over 22V peak to peak) to line level +4dBu balanced signal that can be reliably routed through your studio so that your modular can be treated just as any other pro audio device. 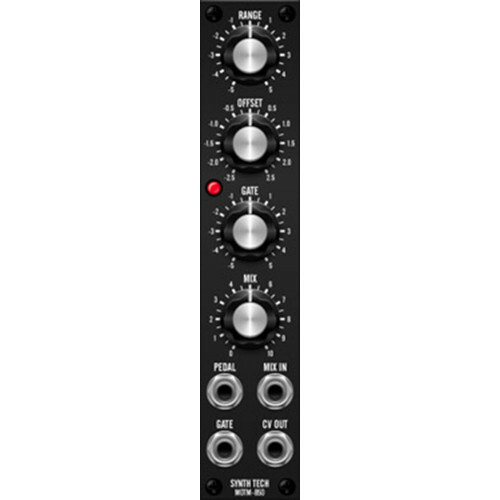 With 8 channels of outputs and 8 channels of inputs per 10hp module, you will reduce the need to pre-mix signals before recording, allowing for greater flexibility at mix-time. Reverbs, delays, dynamics, EQ, distortion, anything else you can think of. Integrate your +4dBu studio gear into your patches with no special cabling or compromising unbalanced cables. Process audio with your DAW just as you would any other external effects processor. Along with a MIDI to clock converter, you can even get tempo synchronized processing, all at studio levels with balanced cabling. 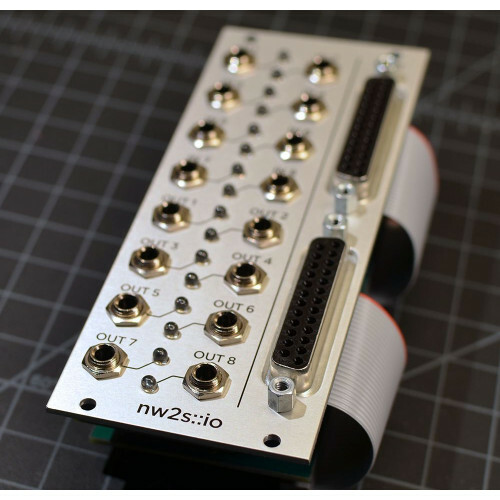 The nw2s::io is DC coupled, so you can integrate Silent Way into your studio without the need for special cables that defeat the noise-cancelling properties of balanced interfaces. Note that your audio interface will also need to be DC-coupled to support this. The MOTU line of interfaces are probably the most widely used for that purpose. Of particular note is that the Avid HD and 192 IOs are DC-coupled in that they have no capacitors in the audio path, but like the Jensen microphone preamps, they contain a DC-servo circuit that prevents DC from entering the circuit. Those topologies should not be used for recording CV. A common question is what cabling you should use on the other end of the DB-25 cable. The simple answer is to use whatever your interface uses. For example, an Avid HD IO uses DB-25 as well, so you’ll want a DB-25 to DB-25 cable. Where things get a bit more complicated is when there are multiple options on your selected device. Many mixers provide both XLR and TRS. Read the documentation! Some may provide line inputs on the XLR connector when a physical switch is flipped, others may provide mic only on XLR and line only on TRS. Each case is different. If you have any questions, contact us either directly or on the MW forum with details about the connections you are trying to make.